I previously wrote about my first New York poké experience. Here's why I find it kind of funny. As I said, I grew up on the stuff, more or less. But these days there is SO MUCH poké to be had back home... supermarkets have a poké case along with a deli case. Photographic evidence from Foodland in Waimea on Hawai'i. 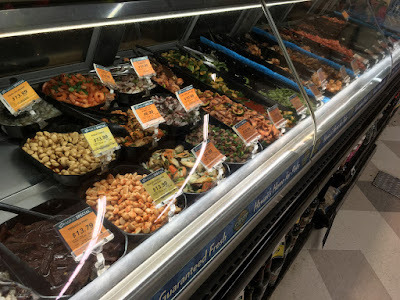 It's a little tough to tell as some things in the case aren't poké (there's some picked garlic, and edamame) but there are something like 20 different kinds to choose from, and the really good stuff will run you about $18.99 a pound on manager's special (if you have your Maika'i Card with you). The other thing to note is that poké is really popular! 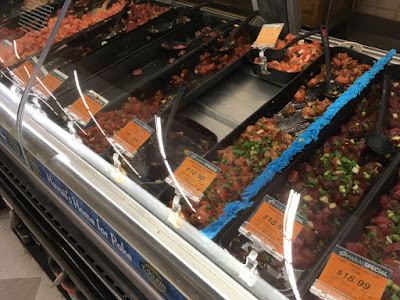 This was from a late afternoon trip to the market, and popular flavors do sell out. While I admire the amount of effort New York City is putting in to close the poké gap, I conclude that it still very much remains tilted in favor of my native land.